Frigoverre makes hands down the BEST glass pitchers with lids. I refuse to store my homemade almond milk and fresh juices in nasty plastic pitchers. I also won’t risk leaving them open and uncovered in my lidless glass pitchers. So, I’ve tried more than my fair share of glass pitchers with lids. Some are too thin and break at the slightest tap when you clean them. Some have useless lids that don’t keep other scents out or the liquid in when you shake it. 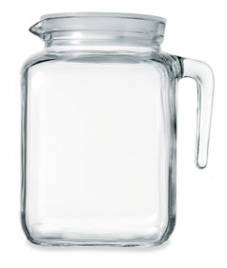 To save you time, money and disappointment, here are the very best glass pitchers with lids. Here is the scoop. Amazon has the one liter pitchers for $7.95. Of course that depends on the day of the week! You’ve got to watch Amazon because their prices change throughout the week. But if you can order these for less than ten bucks a pop, they are cheaper than cooking stores. For whatever reason, Amazon charges significantly MORE for the two liter pitcher, about $18.95, than my favorite local cooking store which charges $12.95. I’ve seen these at The Container Store $4.99 and 7.99 but after the shipping charges, Amazon is better for the one liter. Pop into your local cooking shop for the 2 liter. 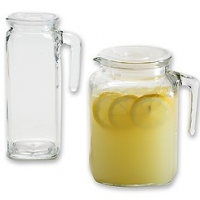 The One liter pitcher is ideal for small batches of fresh juice. It is also perfect for what is left of a full batch of fresh almond milk after my family has enjoyed some for breakfast. This size holds the ideal amount for a picnic for two or three people. The seal is strong so you don’t need to worry about leaks. Be sure you get the hang of using the lids by testing it with tap water first. Once you get the hang of twisting the center of the lid to expand the rubber ring into place, you’ll find it works beautifully. 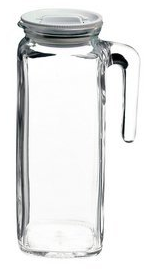 The two liter pitcher works well for a big batch of tea, lemonade or juice. I like it for serving flavored water. Try using a vanilla bean pod instead of discarding it once you’ve used the seeds. Cucumber, mint, or basil all work very well for flavoring water. This pitcher is wider, so it takes up more room in the fridge, but it is short too so it can go on a shelf with less top space. The two liter is more useful for families, because one liter of a yummy juice goes quickly!